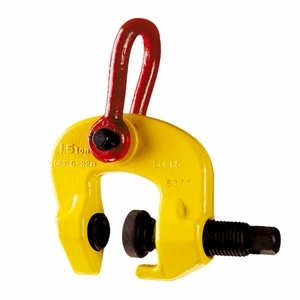 These universal screw clamps are for both vertical and horizontal lifting, as well as transporting of a large variety of steel structures. Each clamp is fitted with a moveable cam on the threaded spindle that provides a powerful clamping force on the item being lifted. The lifting eye is articulated which ensures an effective clamping force in every position. The hardness of the cam and pivot is suitable to lift material with a hardness of maximum 37 HRC / 420 Brinell. Available in capacities from 0.5T - 6T (metric rated) with varying jaw openings. Each clamp is made from quality steel components and is backed by great engineering and a 5 Year Warranty.